Oh my lord, I thought it would never come. But despite the waist-high piles of snow and ice settled around my house, there’s finally been enough thawing to begin to welcome that lovely microseason of early spring known round these parts as Mud Season. Although I know it will soon have my washing machine begging for mercy, I am so excited for my kiddos to have something to play in outside besides the ice and snow that has blanketed our part of the world since last November. 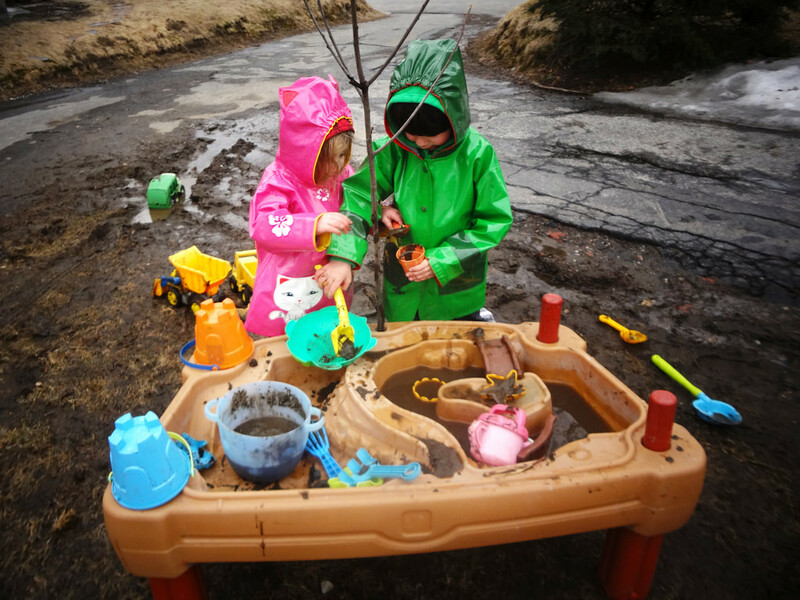 Let the Children Play had a great post a few years ago on how to embrace and even, gulp, enhance mud play for preschool-aged kids. 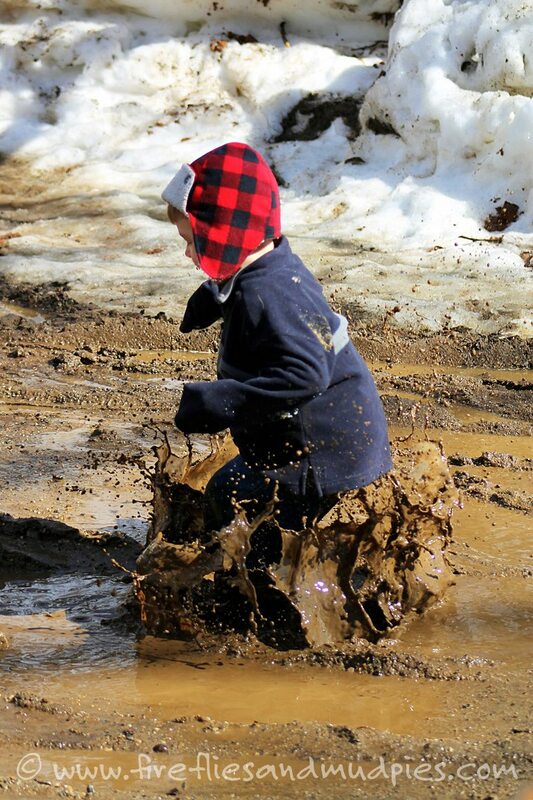 Puddle jumping is the classic mud season activity, and one that kids certainly don’t need to be taught or provided any encouragement to do, in my experience. But I’m just putting it on here to encourage parents to give it a try themselves! I think my all time favorite Henry and Mudge story is Henry and Mudge in Puddle Trouble, where Henry and Mudge sneak out and go bonkers in a huge mud puddle, and then when Henry’s dad finds them, instead of being mad that they a) snuck out without a grown-up, b) made an enormous mess of themselves, and c) splashed mud all over him, he just decides to jump in along with them. I absolutely adore these photos that Melissa of Fireflies and Mud Pies took of her boys going to town in some amazing mud puddles. 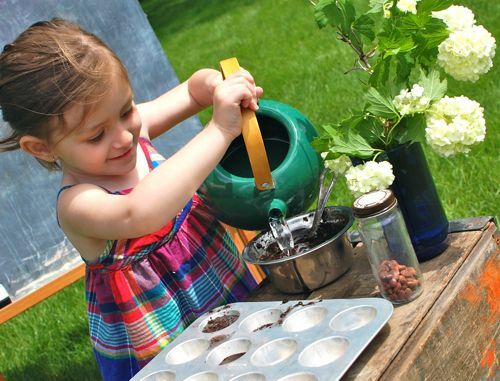 Another great idea is to stock a simple mud pie kitchen, like this one from Inner Child Fun. Some vessels, some utensils, a water source, and a few extra ingredients like dried beans or birdseed, and you’ve got yourself a pretty sweet set up for some mud kitchen magic. and apparently, you can even make paint out of mud! Speaking of paint, I can’t wait for a good rainy day to try this cool raindrop splatter paint project from Little Page Turners. Happy mudding, and if you’ve got any more fun mud-based play ideas, send ’em my way! So for all those who love to collect and receive Mother Nature’s goodies, I put together this little round-up of different ways to explore and create with natural items. Whether you’re gathering on your own or trading with a partner in the nature exchange, these are some great ways to have the fullest experience with your natural finds! Just a reminder, if you are using items you’ve received in the nature exchange, please keep your exploration indoors so you don’t accidentally introduce invasive species into your environment. 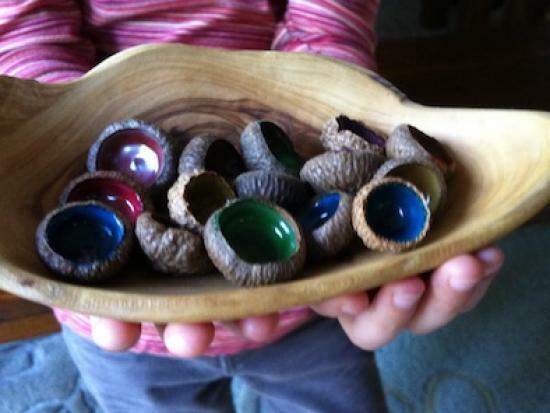 When we come home with treasures from a nature walk, I usually begin by just setting them out for open exploration. 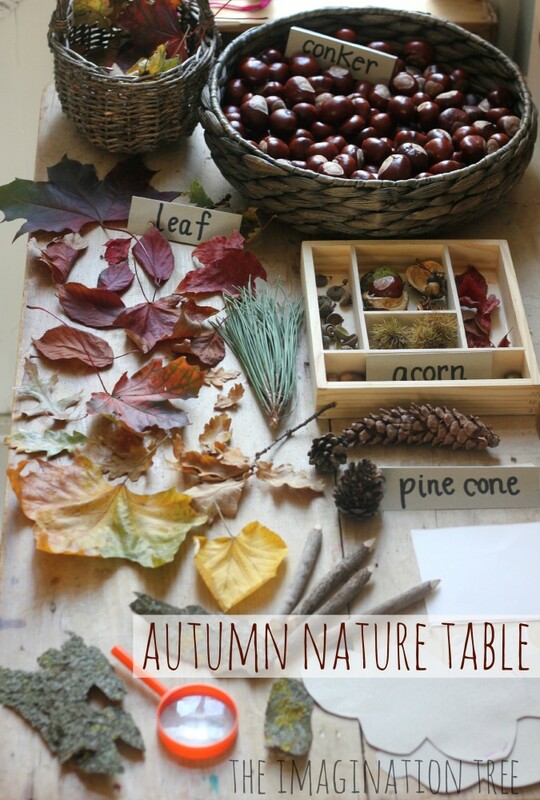 This can be something as simple as a large platter or tray to spread the items out on, or you can make a whole nature table with them, like this wonderful one from The Imagination Tree. Another way to enjoy natural items is to create a small world box with them. Any semi-enclosed space can work for this kind of project. In this post on Create with your Hands, our old favorite, the cardboard box, does the trick. With natural items combined with small animal figures or dolls, kids can make a whole little world of their own. After plenty of time to enjoy the sensory, and tactile experience of nature finds, you can make them into something to decorate your space. 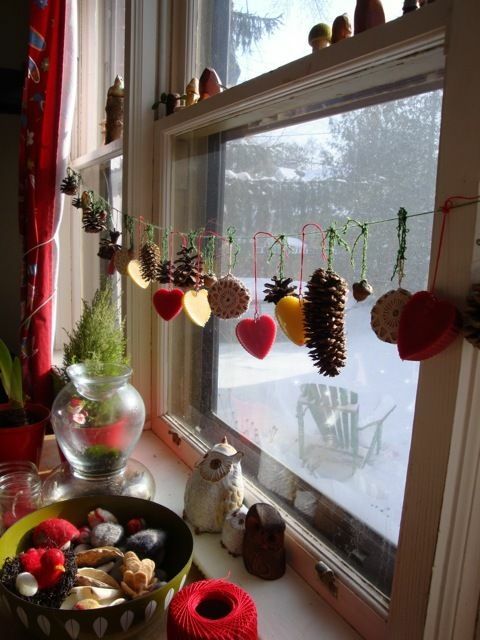 I wish I could find the original source for these simple but beautiful hanging decorations. It looks like some twine and a large stick are all you need to make them – and maybe a dab of hot glue here and there for the more slippery-shaped objects. 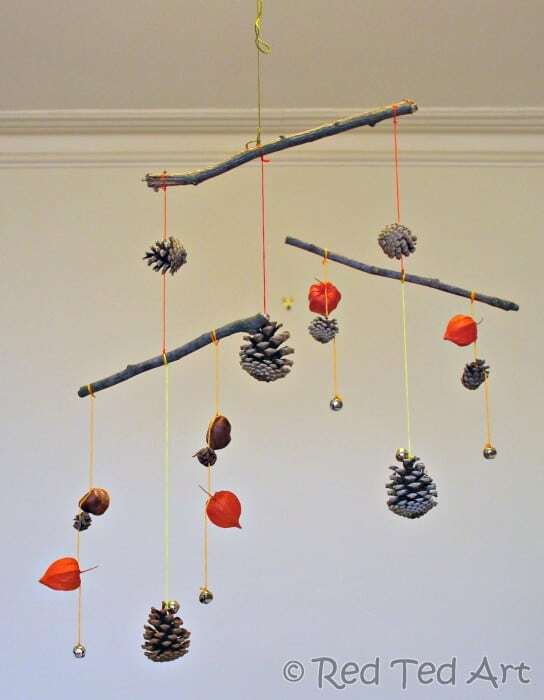 Here’s another way of making a hanging decoration out of nature stuff – this adorable mobile from Red Ted Art. Bonus: this one actually has instructions! For the slightly more ambitious, here’s a really cool wreath project from Fun at Home with Kids, with, once again, cardboard and nature things as the main materials. And it wouldn’t be a 2010s craft round-up without a garland, would it? I’ve been admiring this one on pinterest for a while, but it turns out it’s another one of those untraceable images seems to exists nowhere but pinterest and a bunch of Eastern European home decor image collection blogs. Still, this one looks super easy to create too, just yarn and your favorite nature and seasonal items. 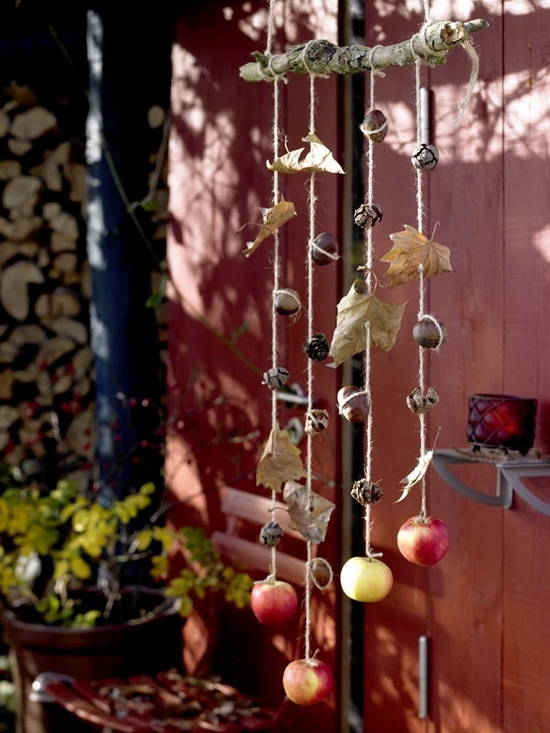 Another way to create with natural items is to paint them. 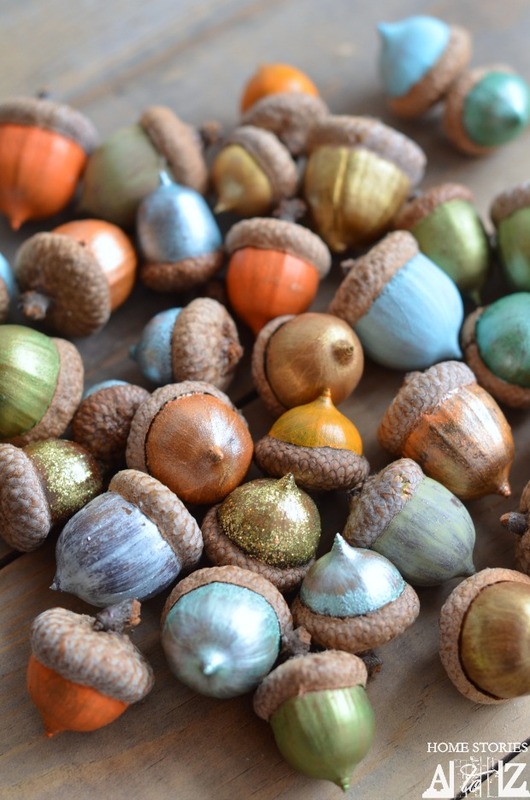 Colorful acorns are another ubiquitous pinterest thing, but these ones from Home Stories A to Z are just so cute, and you could do the same idea with many other nuts, seeds, or stones. I also love these acorn cap jewels from Kiwi Crate. So pretty, and easy enough for kids to do it all themselves, with nothing more than markers, white glue, and playdough. It’s also fun to make something entirely else out of natural items. 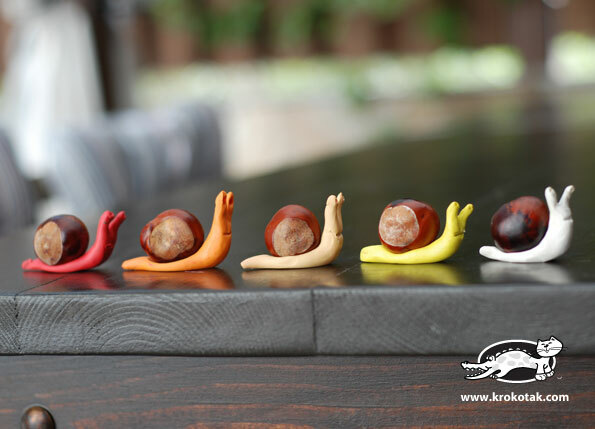 I love Krokotak’s little snails made from buckeyes (as we call them in the midwest). And if you have some wool roving and wooden beads, you can make these cute little pinecone fairies from a tutorial on Willodel. Or these squee-worthy milkweed pod babies from Kleas, another terrific project that even a preschooler can make. And these are just a starting point – the stuff we gathered last fall, and even things we received two years ago in another nature exchange are still floating around my house, decorating candleholders, serving as hideouts for playmobile people, taking on their own lives in a made up game with rocks and bits of yarn. Here’s hoping your fall nature finds bring you months of enjoyment!